The CD243 antigen (P-gp) is the 170-180 kDa multi-drug resistance (mdr)-1 gene product. This protein carries out ATP-dependent efflux of structurally diverse lipophilic compounds, including many anti-cancer chemotherapy agents. In hematopoietic cells, the mdr1 gene product is expressed, but at relatively low levels. P-gp is expressed in specialized epithelial cells with secretory or excretory functions. In the liver, P-gp is found on the biliary surface of hepatocytes and small biliary ductules; in the pancreas, on the laminal surface of epithelial cells of small ductules and, in the kidney, on the brush border of the proximal tubules. Additional sites of expression include the gastrointestinal tract, endothelial cells of the brain and the adrenal glands. 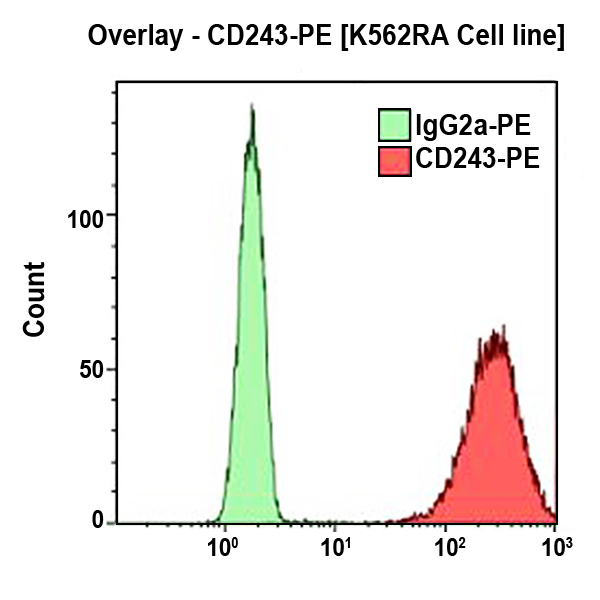 Clone Description The UIC2 antibody reacts with an external epitope of the human P-glycoprotein (P-gp). UIC2 antibody inhibits Pgp-mediated efflux and potentiates the cytotoxic action of P-gp transported drugs in MDR cells.